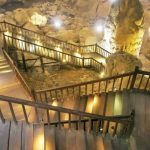 Phong Nha cave and Paradise cave are the two most famous caves in Phong Nha – Ke Bang National Park, which was listed in UNESCO’s World Heritage Sites in 2003 for its geological values. With a length of 7,729 m, Phong Nha cave is considered as one of the world’s longest wet cave, while Paradise is the longest dry cave (31 km). 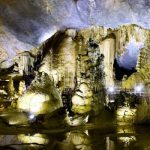 Both of them have created a special attraction for the “Kingdom of the caves”, Phong Nha Ke Bang National Park. Nowadays, there are a lot of tourists not only domestic but also international coming to visit and admire their beauty. If you are a person who likes exploring caves, Phong Nha is really an ideal place for you. 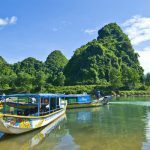 Join Phong Nha and Paradise cave tour from Dong Hoi to explore the most magnificent and brilliant caves. Join us, we make sure that you will have unforgettable memories and experiences. 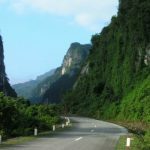 At 07:45 – 08:00 a.m: Our car and tour guide will pick you up at your hotel/stay in Dong Hoi city and depart to Phong Nha town. 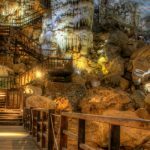 After 45 minutes, we will arrive at Phong Nha town to visit Paradise cave – the longest dry cave in Asia (located in Phong Nha – Ke bang National Park’s core zone, 25km about Phong Nha cave, 75 km about Dong Hoi and 1h20 minutes driving)at the rest of the day. At 01:30 – 04:30 p.m: Leave Paradise cave, we transfer to explore the most impressive Phong Nha cave (50 km about the city, 45 minutes driving). We will take a boat to cruise on Son river. While on the boat you will see the greenfield, people, houses and limestone along the river. 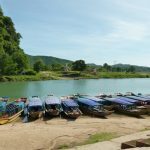 After 25 minutes on the boat, visitors will arrive at Phong Nha cave, take a couple of hours to see the cave. 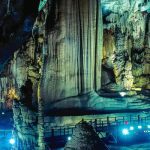 This cave is a water cave and famous for its rock formation which has been given names such as the “Lion”, the “Fairy Caves”, the “Royal Court”, and the “Buddha”.